While searching for a vest pattern to knit for a grandson's golf outings, I found this fabulous easy pattern for women or men, worked in three easy pieces. Cecilia of Sweden likes to be called "Cila," and says she's not a very good knitter and doesn't like difficult patterns. Well, low and behold, as simple as it is, this cowl neck vest pattern called "Lättstickad Tröja" (light-weight sweater) is a very useful addition to anyone's sweater collection, especially for the crisp days of autumn. With bulky yarn and US 15 (10mm) straight needles, it's just amazing what one can knit! "Ingot," an oversized cowl, promises to be your go-to favorite scarf for fall. 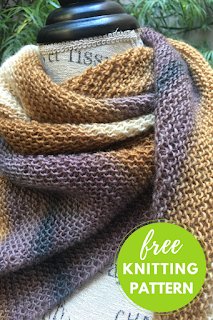 The cowl pattern, written by Lisa Mutch of Northbound knitting and hand-dyed yarn fame, is a free pattern download. The yarns are exquisite and dyed to order in your preferred colorway. 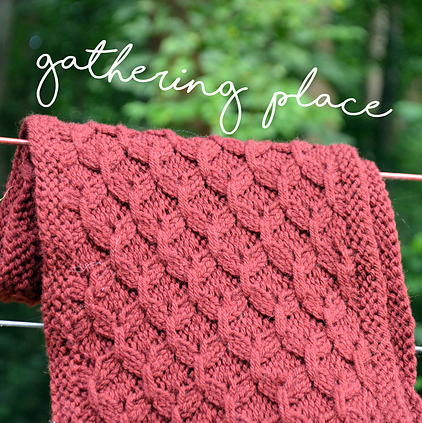 This cowl project requires two skeins or 320 yards (293m) of DK weight yarn. Knit on a US 11 (8.0m) circular needle, the pattern is an easy one, two pattern rows, knit in three sections, with straight stockinette in the middle section. Sampler baby blankets and throws can be knit in squares and sewn together or knit as one piece. 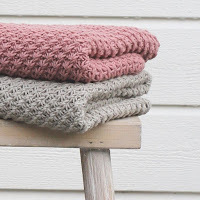 Blankets are lovely fall and wintertime projects, as the colder it gets and farther you knit, the warmer you are. This Aran christening blanket seen here was knit as one piece with one colorway of yarn and a separate border knit in cotton and sewn on. Knitnscribble also ran a quarter inch ribbon through the fluted lace top and tied the ends in a bow at each corner before gifting. There is no time like the present to start thinking of your Hanukkah and Christmas knit lists. The Camp Out fingerless mitts pattern by tante ehm is one knitnscribble used long ago for holiday gifts. 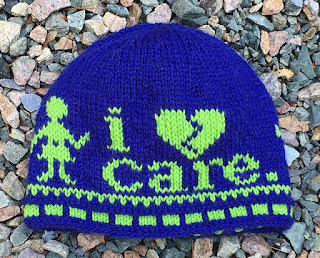 An easy free knitting pattern, you can almost finish in a one-night sitting. 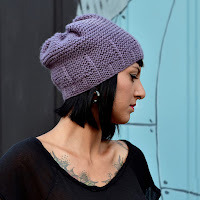 Pattern instructions are now available in eleven (11) different languages, and the English version accommodates Aran, worsted, OR sport yarn, great for stash-busting, too. With variegated yarns, you can knit more than one pair and mix and match, if one is lost. I just love this fingerless mitts pattern, hope you will, too. Years ago, knitnscribble realized after knitting the old smocked dishcloth that favorite stitch patterns could be used to knit new original designs. Pattern stitches aren't just meant for dishcloths; they can actually serve as big swatches of inspiration. This morning, I stumbled across these lovely baby blankets on Instagram knit by Norwegian, Strikkly Speaking, and realized the stitch was the same as Windbreaker, the sweater I had just finished. The star stitch has been relaxed in the blanket to achieve a softness desired for baby. Australian-based knitting designer, Ambah O'Brien, has posted a new shawl pattern you can wear as a triangle scarf that has a picot edge bind off, one of two bind offs available. As usual, this talented designer has included a wealth of information for this knitting project, including a KAL, types of yarns, colorways, videos, and discount options. If your granddaughter or grandson is a child of the sea and disciple of its creatures, this little mermaid will be a favorite new doll. 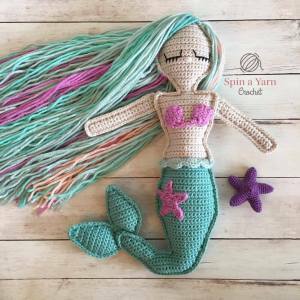 An amigurumi mermaid rag doll free pattern, with easy to follow directions, by Spin a Yarn Crochet, it's finished size is 12.5 inches (32 cm) "from the top of her head to the bottom curve of her tail." Spin a Yarn Crochet has an abundance of amigurumi sea creature patterns and other themes including Harry Potter and holiday ornaments offered as free patterns for crochet toys. 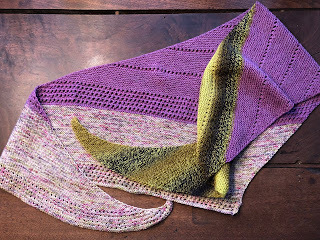 Noble Knits has posted a free knitting pattern for a lovely triangle scarf, using only one skein of self-striping yarn, Berroco's Nebula in luscious colors at just about $20.00. 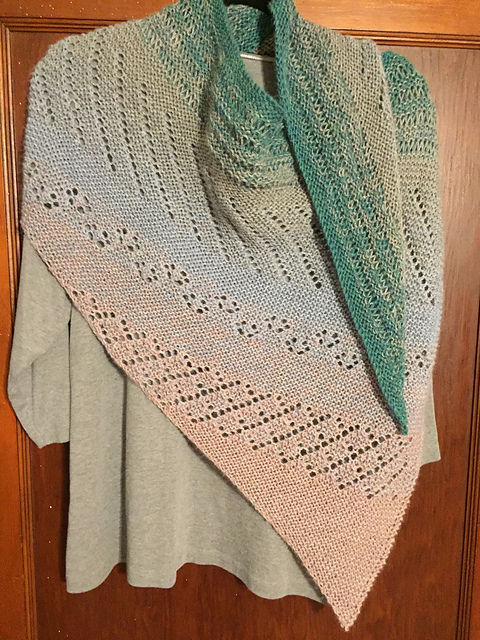 The shawl pattern is easy to remember, one that won't keep you counting on the beach, or whilst commuting, or watching tv, and portable, great for stuffing in your purse. 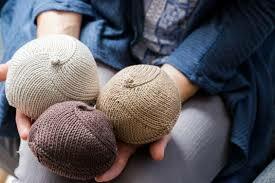 Knitted Knockers come in all shapes, sizes, and colors and are available free worldwide to breast cancer patients who don't undergo breast reconstruction. If you knit or crochet, there are free knitted knocker patterns in several languages and breast prosthetic kits you can purchase. 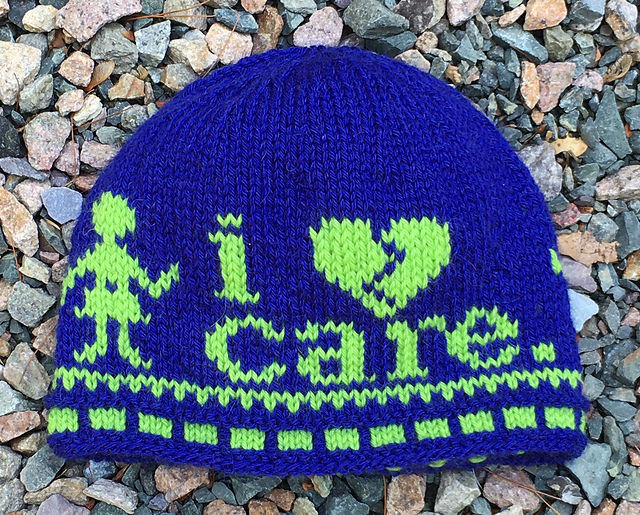 And, yes, there are endless possibilities for charity knitting and crochet for hospitals and doctors. 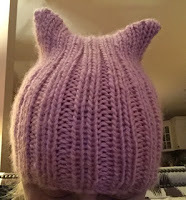 Yesterday, knitnscribble posted a link to a video from one knitted knocker organization on Facebook and the reception from breast cancer survivors and their friends was overwhelming, so thought it needed more explanation. Yes, "you have greater powers than you know." The Wonder Woman wrap shawl pattern has been published in English, Spanish, French, and Portuguese for knitting and crochet. It's a free pattern, an easy pattern, "kept as simple as possible, so it would be accessible to a wide range of knitters," by Carissa Browning. 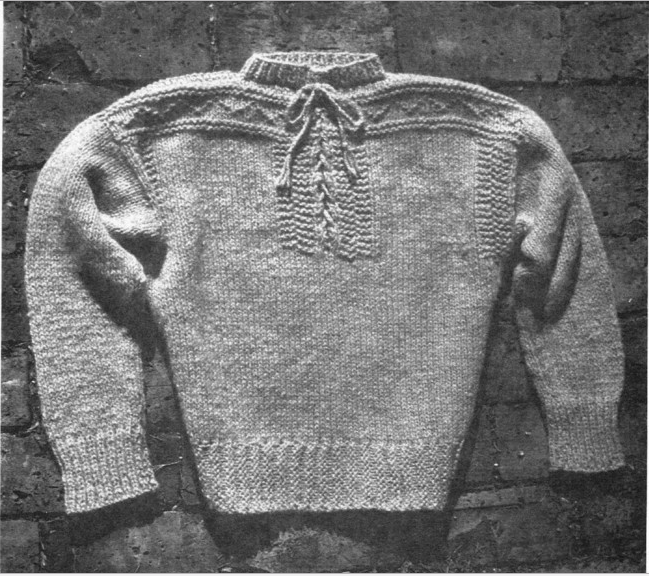 In the early days of summer, way back in the dinosaur age, I learned to knit at about age 8. This post contains links for easy free patterns, perfect for vacations. Summer is the perfect time to learn to knit or to crochet, away at camp, sitting at home in the AC or vacationing. You can even teach yourself with YouTube videos. 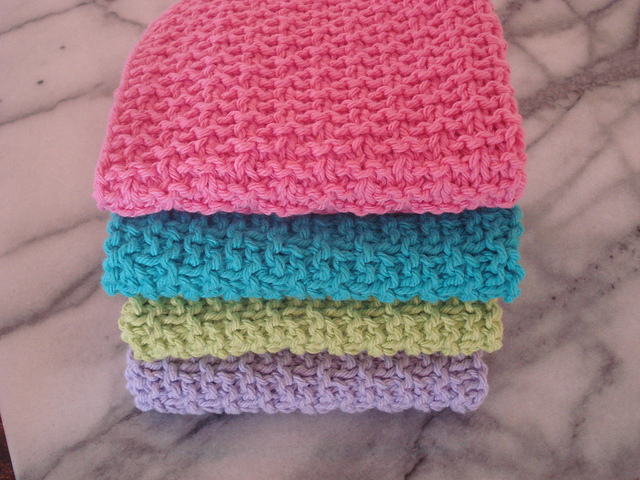 There is an abundance of free patterns, easy patterns like a dishcloth, which offer a quick path to success, and make useful gifts as well. Cotton yarn can be purchased for about $2.00, a pair of US 8 (5mm) straight needles, or an H hook, and you are on your way. 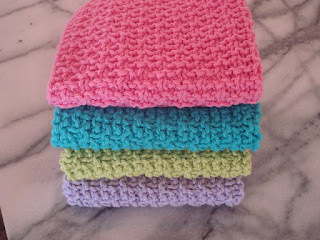 Read on for other easy knitting projects paired with links for free patterns to knit and crochet. 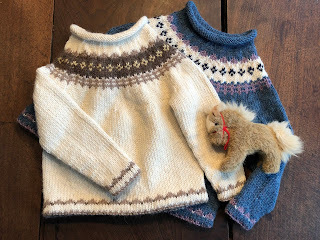 The Portuguese Fisherman's Pullover sweater knitting pattern has been knit thousands of times and one I used to teach my daughter how to knit, as it is classified an "easy knitting pattern." 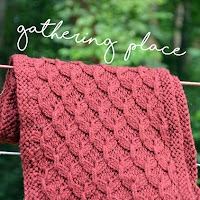 It's a great summertime project for beginning and vintage knitters. The unisex size range is 2 to 46, for men, women, and children. Knit on a US 10 (6mm) with Aran or worsted yarn, the pullover sweater's classic style is a timeless unisex design. 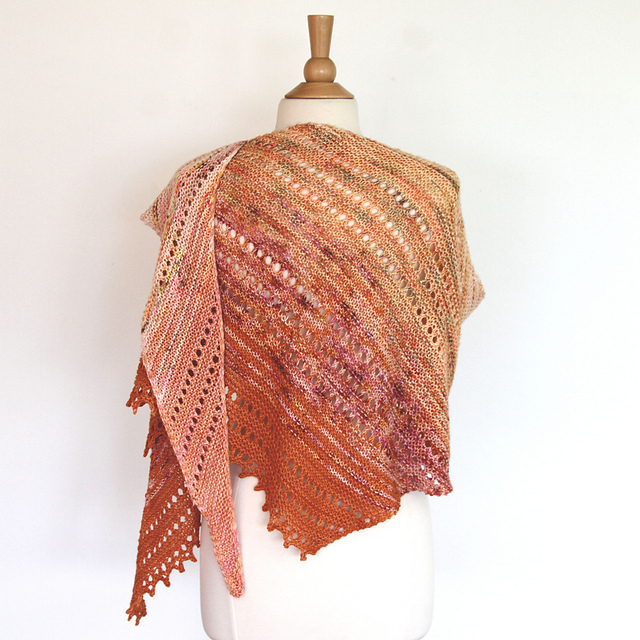 Michelle Hunter's new shawl knitting pattern, "Transient," is perfect for summer knitting. It is a free pattern and uses "Concentric," a new gradient worsted yarn by Hikoo for Skacel. The colors are glorious and your knitting will be fast as you move from one color to the other and also one stitch to the other. 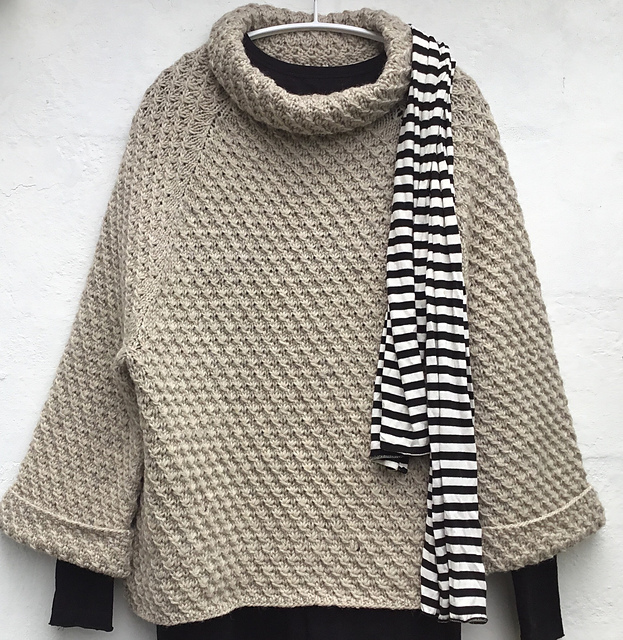 Concentric is 100% baby Alpaca, so this lovely shawl can be worn on cool summer nights or warmly around your neck this winter as a triangle scarf. The finished scarf or shawl is 53" at the widest depth and 27" deep. And now what everyone has been searching for: Nakia's scarf from the new Marvel film, Black Panther. 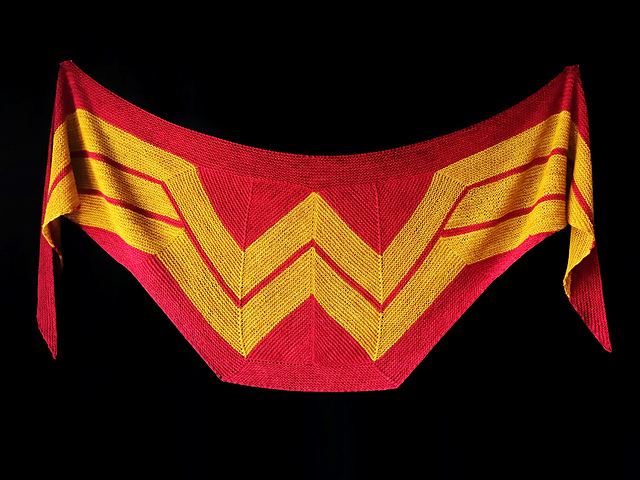 A rarity for sure, in that, Nakia's shawl knitting pattern has been posted straight from the "horse's mouth," Jeff Gillies, who worked on costume design for the movie. 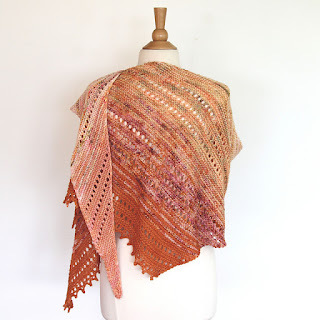 The oversized wrap shawl uses four different yarns to achieve the brilliant fabric color and texture of the original. 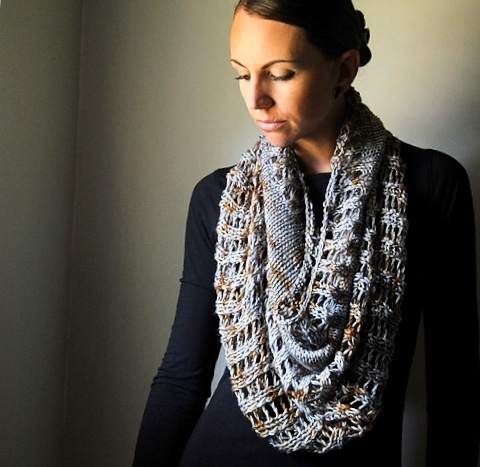 "Nakia's Infinity Scarf" by Jeff Gillies is a free pattern posted just this week. Sitting here listening to this Nor'easter - the wind, rain, and snow battering the trees and the gate banging in rhythm, the reality of knitting Lone Kjeldsen's "Windbreaker" pattern became quite clear. 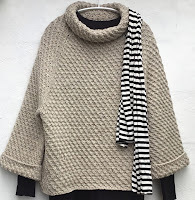 It's a wonderful design for layering in the fall, when my granddaughter goes off to college. I chose Tahki's Donegal Tweed, Irish spun in Dublin, which harkens more memories still. In my younger days, Irish yarn was the choice of natural fiber yarn snobs, especially here in the Northeast. While "Windbreaker" doesn't have any cables or bobbles worn on St. Patrick's Day, it does have stars. The First World War began with the assassination of Archduke Ferdinand of Austria in 1914 and ended on November 11, 1918, remembered as Armistice Day. WWI was one of the deadliest wars in history; UK deaths numbered 700,000 out of an estimated 16 million casualties. 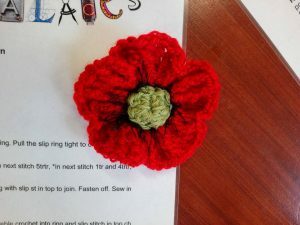 The Cornwall Regimental Museum poppy project is seeking to honor all of Cornwall's WWI dead veterans with handmade poppies created from patterns or imaginative artfulness. Over 4200 poppies: knitted, crocheted, embroidered, beaded, and even paper ones made by scouts have already been collected, and now the goal has been more than doubled to 9,687. All sorts of free poppy patterns are available for knit or crochet poppies.